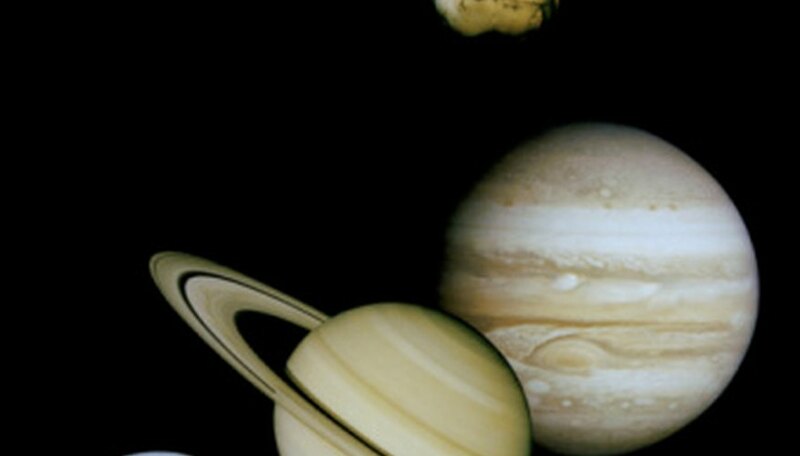 Astronomy and cosmology can be abstract concepts for young children to grasp, and can be confusing if you just read to children from books about the solar system. One alternative is to put together a whimsical and creative craft related to learning about the solar system. For example, you can help children construct a solar system out of different candies that the kids can use as a model, and then eat once the project is complete. Line an aluminum jelly-roll tray with a 1-inch layer of modeling clay. Insert the stick of a large, 6-inch-wide yellow spiral lollipop into the clay at one end of the jelly roll tray. This will represent the Sun. Press the sticks of eight more round lollipops into the modeling clay along the length of the jelly-roll tray, spacing each lollipop at least 2 inches apart. Select lollipops that will represent the individual planets. For example, use a small, round, red lollipop to represent Mercury, and a larger, blue, round lollipop to represent Neptune. Slide a gummy ring around the round lollipop that represents Saturn. If the gummy ring slides off too readily, moisten the inside and hold it in place on the lollipop for 3 minutes to allow it to adhere to the lollipop. Cut out nine rectangles from card stock that each measure 1/2 inch wide, 1 inch long. With the paint pen, write each of the names of the planets and the Sun onto a card-stock rectangle, then glue each rectangle onto the end of a toothpick. Let the craft glue dry for 20 minutes, then insert these labels into the clay next to the respective candy planets and star.